On our way back from our trip/wedding, we will be stopping through Saskatoon,Sask..It's a 6 hour drive south from here, but where we have to drive to to catch a plane.Since we'll be getting in late too, we will need a nice relaxing place to stay.The Radisson Hotel Saskatoon looked like a wonderful place to lay our heads for the night. This hotel is the city's largest hotel and has recently undergone a $5 million renovation to their lobby, second-floor convention space and their Waterworks Recreation Complex, which features a three-story waterslide, pool, whirlpool and fitness room. The Radisson Hotel Saskatoon, SK is located downtown in Saskatoon, Sask., overlooking the South Saskatchewan River Valley and City Center. 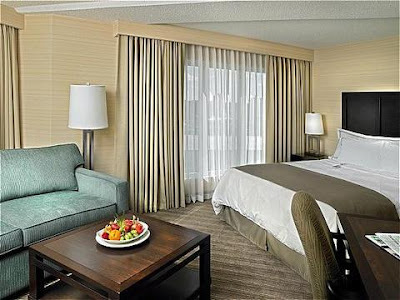 With 291 rooms and 19 floors, the hotel is said to offer breathtaking views of the river valley as well as the downtown core. Plus with their Club Carlson, I can earn points towards free stays and so many other great club freebies. We look forward to our stay. Hi, Debs Dealz stopping by to follow you via GFC. I love your site! I would like to invite you to check out by blog as well, and follow me back if you like, and/or like me on Facebook. We have daily blog hops...we would love to have you link up and participate!! We feel the blog hops are great ways to network with other bloggers, increase our followers and meet awesome people! We currently have the Wacky Wednesday Blog Hop available to link up to. Stop on by!! Also, if you exchange buttons let me know! Oh it looks very lovely!